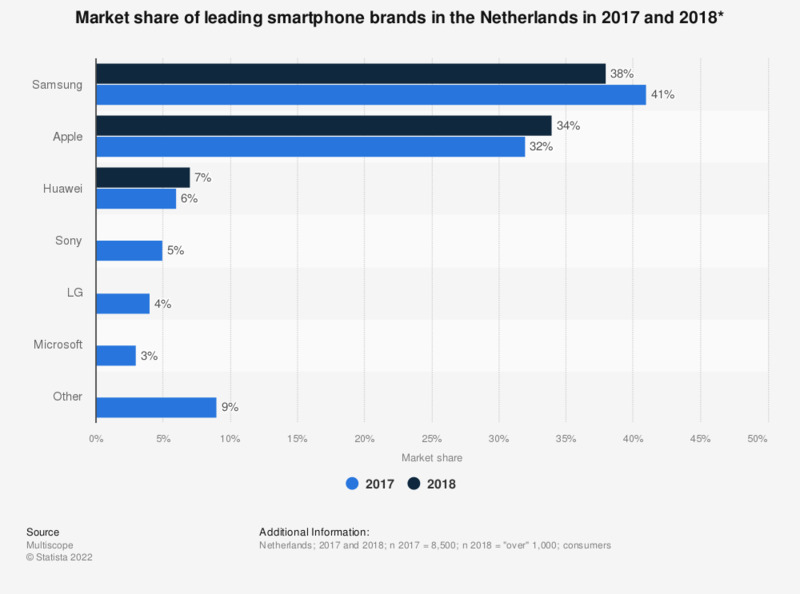 This statistic shows the results of a survey on the market shares of leading smartphone brands in the Netherlands in 2017 and 2018. In 2018, Samsung was the leading smartphone brand in the Netherlands with a market share of approximately 38 percent. This is a decrease when compared to the previous year. Number two in the Netherlands is Apple. These two brands together took up almost 75 percent of the total market. Chinese Huawei was showed an increase in market share. In recent years, smartphones have become increasingly popular in the Netherlands. In 2017, the number of smartphone users in the Netherlands is estimated to reach 12.6 million. Big Fintech-services like Android Pay, Apple Pay and Pay from Samsung, however, are not yet released in the Netherlands. Dutch banks therefore focus on iDEAL and continue their support in developing or introducing new mobile payment methods on their own. * For 2018, the source only provided a top three. Numbers on brands like Acer, HTC, Asus or OnePlus were not mentioned at all. Everything On "Mobile device usage in the Netherlands" in One Document: Edited and Divided into Handy Chapters. Including Detailed References.